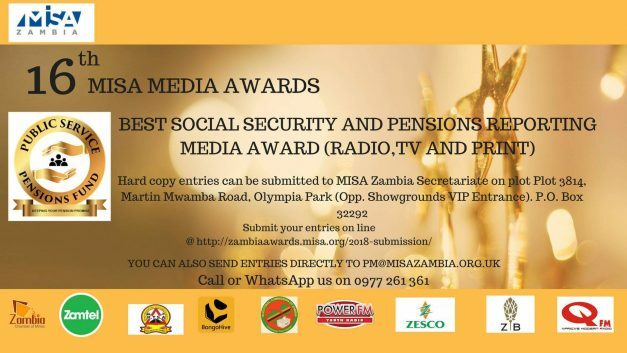 The Media Institute of Southern Africa (MISA) Zambia has announced its partnership with the Public Service Pension’s Fund (PSPF) in the 16th MISA Media Awards. The awards will be held on April 28, 2018 at the Taj Pamodzi Hotel in Lusaka. The Public Service Pension’s Fund will support the media awards through sponsoring the Best Social Security and Pensions Media Award in the categories Print, TV and Radio. The Best Social Security and Pensions Media Award recognises reporting detailing pensions and social security and its importance. The stories should also dwell on the investments being made by PSPF to increase its funding base. This Award category like all categories in the 16th MISA Media Awards are open to both public and private media that publish to the Zambian populace. “As MISA we would like to thank PSPF and all other sponsors for the 16th MISA Media Awards. It is such partnerships that go a long way in fostering media development and recognizing the significant role that media play in the development of the nation,” reads part of a statement released by MISA Zambia today.